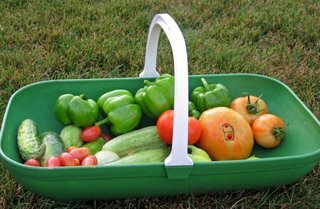 Once you get into gardening, you find there is suddenly a lot to lug around the garden, or haul home from the garden center/nursery/mulch store. And for whatever load you have to carry, there is, of course, the right “tool” to make it easier. Here are some of my hauling tools. 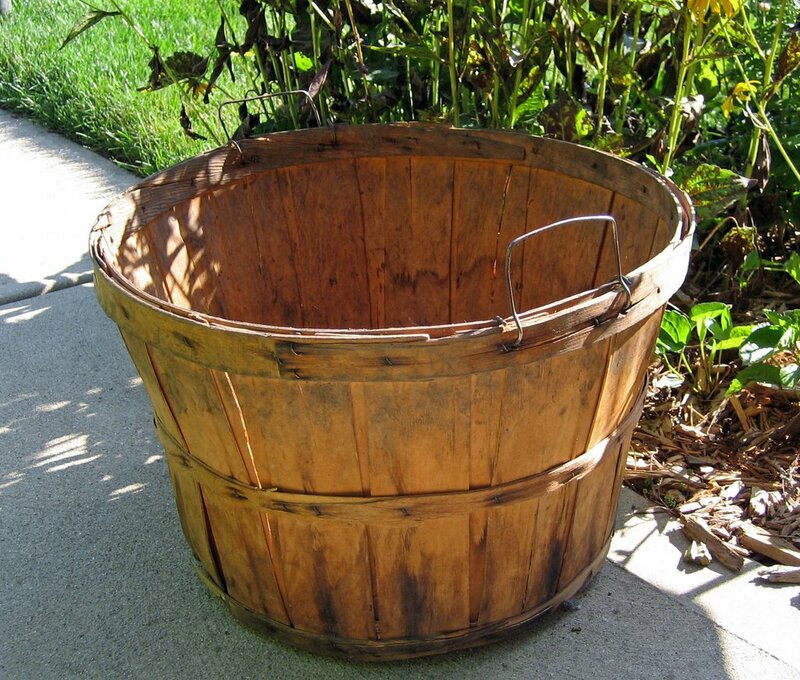 This is a common ordinary bushel basket. This goes along with me while I’m weeding. It’s just the right size so that even full, it’s not too heavy to carry back to the compost bin. Don’t tell my sister, but I got this at HER garage sale. She had $1 on it, and I didn’t even haggle over the price. I just bought it and I use it all the time! I hope she doesn't see this and want it back. Oh, and while you are keeping secrets, don’t tell the neighbors about the compost bins. 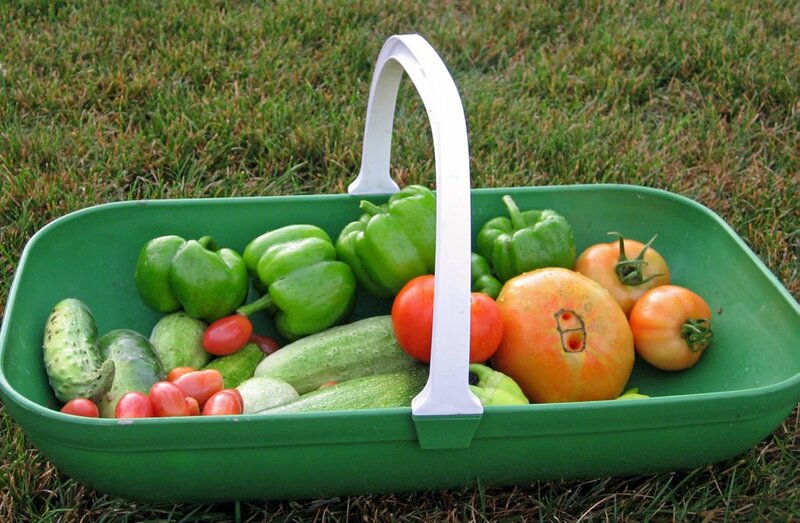 Let's move on to carts because not everything in the garden can just be carried around in a basket. First, on the right is my traditional wheel barrow. This is the only one I’ve ever had. I got it in 1987, so it is almost 20 years old! Can you believe it? I can’t! You all know how useful it is to have a wheelbarrow to move sod, soil, mulch, and more, so I won’t go into all of that. Second, in the middle, is my flat cart. This is a good cart when you need to move something that doesn’t quite fit in the wheelbarrow. My only regret is that I bought this when they first hit the stores, before they sold them with the optional sides. I think it would be just a tiny bit more useful if it had sides you could add to it on occasion. Finally, on the left is my LUV cart. LUV stands for Lawn Utility Vehicle, and guess what? It’s motorized. It is self-propelled like a lawn mower, and that makes it easier to move mulch and other big stuff around the yard. It moves a bit slowly (it’s battery-powered) but does the job, and forces you to slow down a bit, take it easy, and let the cart do the work! Finally, the ultimate gardening hauling tool, the one that makes many things possible… a truck. I love my truck and the gardening freedom it gives. I can get a yard of mulch on a whim at the mulch store which is 12 minutes from my house. Or I can get half a cubic yard of top soil. Or a bunch of shrubs, or all kinds of annuals and perennials. You get the idea. I can get some real trouble, I mean some real gardening supplies, with this truck. Every trip out in the truck is a new adventure. And that concludes Gardening Tool Week, I hope you enjoyed it. The weather is all better now (okay some better now), so I’m heading back to the garden, to see if I can put these tools to good use. I do have one note to add for all the new gardeners. I’ve been gardening for quite some time, so I’ve accumulated these tools over many years. I would guess I started to buy my own tools in the early 80's which is two decades ago, plus. I didn’t start out with all of these tools, and you won’t either. So don’t be discouraged or think you can’t garden without a lot of tools. You can! A trowel and some pruners is a good start, and some days it’s all that you need plus maybe a shovel, hoe and rake. And over time you will start to get more tools and better tools and specialized tools. You wait and see! Oh, and I almost forgot… I didn’t show you my hoe collection. In case you just happened to have missed it, check it out at this link! OK. Would you like to admit to everyone that the truck only goes on gardening field trips and no where else, so it has say 1000 miles on it and is 12 or so years old? NEVER allowed to haul furniture or other things -- ONLY gardening related items!!! LOL!! Sister with the homestead, aren't you exaggerating just a little bit? The truck is 9 years old, not 12 years old, and it has way more than 1,000 miles on the odometer! OK. Sister with the homestead wants to make sure that you didn't get that from me--surely it was the old quilting sister? Or the skinny running sister? Yes, I did buy it from you, sister with the homestead. Did I mention what a great basket it is? Just the right size! I take exception to the term "old " quilting sister. Maybe older. Where did you get that trug? I have been wanting one. To set the record straight, it wasn't me who called the quilting sister old, it was the homestead sister! 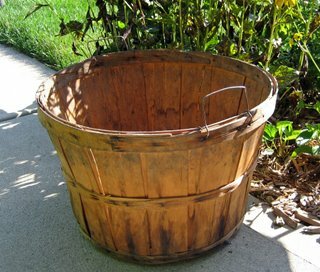 I got the trug from a mail order company but it was a while ago, so I don't remember which one. I'll try to find it.